Two major Democratic groups launched a joint massive get out the vote campaign on Saturday. (CNN) - Two major Democratic committees jointly launched their first nationwide get out the vote initiative of the fall campaign season on Saturday. 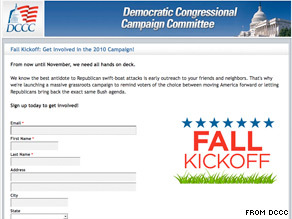 The Democratic National Committee and the Democratic Congressional Campaign Committee set a goal of knocking on 400,000 doors (200,000 for each committee) in 75 congressional districts as part of their "National Day of Action." "This level of voter contact this early is unprecedented," DCCC chairman Chris Van Hollen said in a statement. "We will continue to meet with voters face to face and spread the message about moving the country forward." House Democrats are poised to lose 35-45 seats this fall, according to the non-partisan Cook Political Report. The Rothenberg Political Report, another well respected non-partisan political handicapper, predicts a loss of 28-33 seats. If Republicans take control of 39 Democratic seats, they will take the majority for the first time since 2006. While not holding a similar event this weekend, the Republican National Committee says it's busy as well with get out the vote efforts. The RNC tells CNN they've been holding "Super Saturdays," which are similar efforts, but are held on a state by state basis. The RNC also says that the structure of their grassroots apparatus continues to grow as the calendar moves closer to the midterm elections. In a separate effort that is not affiliated with the Republican Party, the conservative American Crossroads PAC announced Friday a $10 million effort dubbed "MOVERS – Mobilizing Our Voters to End Reckless Spending." The MOVERS program will target Republican and independent voters in eight states, according the PAC's press release. Voters will be contacted through mail and by phone. "We have an unprecedented opportunity to restore balance and fiscal responsibility to Washington this fall," said the president and CEO of American Crossroads, Steven Law. "To do that, American Crossroads will conduct an intensive turnout effort and work closely with other independent partners on mobilizing our voters to end reckless spending." Too bad ACORN isn't still around. They could have provided millions of crooked votes for Democrats! Obummeritus has infected the Party so much that they can't "get out a vote" that isn't there other than what is already present w/in crack houses, Teamsters Union, left wing academia, Muslims, Liberal Media etc. Simply put, the true voice of AMERICA will SPEAK in November! As Liberal Progressives are shown the door at last!